Wash, clean and dry chicken and place it in a mixing bowl which is wide and deep. Mix in all the spices and add ginger, garlic and green chilli paste with lemon juice and massage the chicken for good 10 minutes. This will allow the spices to penetrate in chicken. Mix in yogurt and keep aside for 2 hours. Heat the charcoal BBQ and thread the chicken pieces on metal skewers. 5 – 6 pieces per skewer and grill for about 3 minutes per side. Brush on some ghee and grill for further minute on each side. 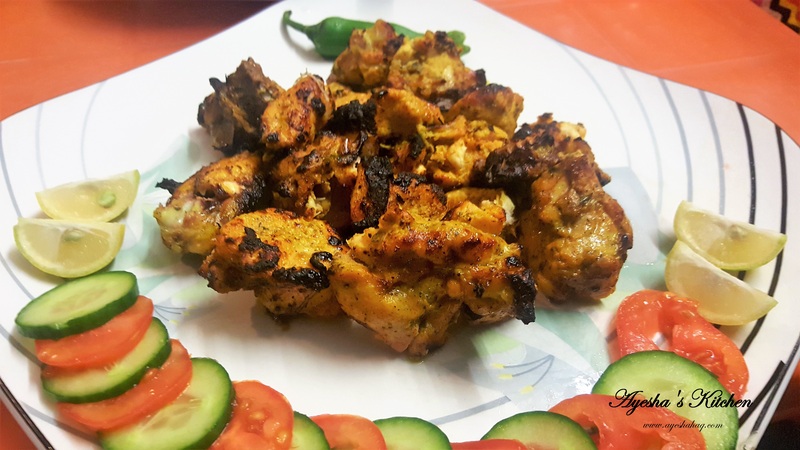 Take them off the skewers and serve hot with naan, salad and raita. I have to wait until the summer to try bbqing this🙄, it’s still wayyyy too cold here in Canada. But I’ll try it in the oven and give it some koila dum. Thanks for sharing! Thanks for liking it. Yes you can make it in the oven 🙂 Enjoy!